The Royal Eye Hospital was truly blessed with a breath-taking performance by the profoundly skilled, award-winning Pianist, Yuanfan Yang. “The music is sublime, it is so therapeutic. It calms you down. If you are angry, it reduces that!” Outpatient at Manchester’s Royal Eye Hospital. People were stopped in their tracks, dumbfounded by the beautifully evocative sounds produced by this sixteen year old. His repertoire was traditional yet innovative, with his own personality contributing to the perfect performance. Transfixed by the sounds, individuals gazed at the musician. One gentleman, glued to the spot in which he stood, refused to stop watching the music, even after multiple family members had beckoned him outside. Any burdensome thoughts, or issues, within that day could wait for a moment. Take a back seat. A lady who also seemed to be unable to make her way to the exit, passionately applauded, shaking her head with respect and appreciation for the music. Upon speaking with this woman, I soon learnt of her musical background, which was ended when the war took over. Her involvement in music went back to when her late father and late husband were alive, being keen musicians themselves. expressing the comforting nature of music and how it is able to endure beyond one space and one time to create a unique experience for each unique human being. Along with the memories that intertwine with music, comes the altered mood state which shines through from the above quote, and the sense of closeness towards others. Music can make you happy! 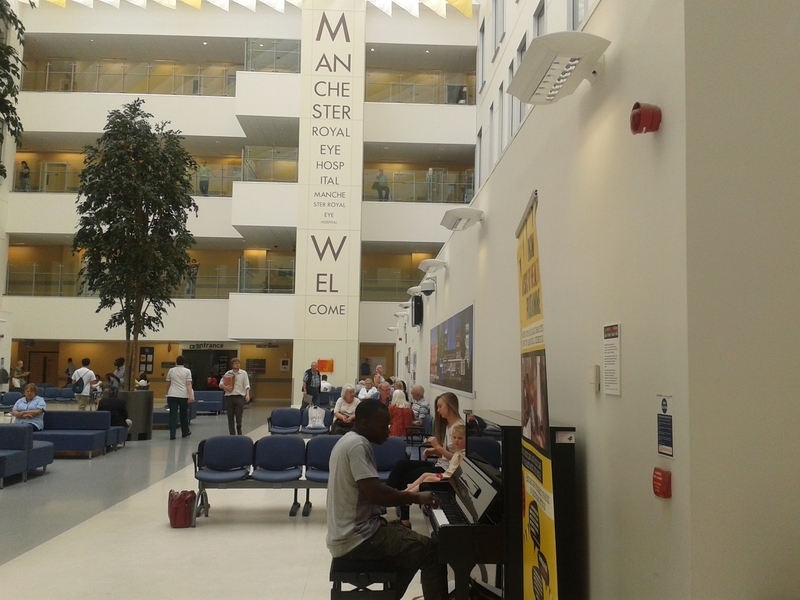 The brilliant Ros Hawley and Mark Fisher aka ‘Delhi Babies’ crafted a beautiful musical experience for those in the MRI Outpatients areas, Reception and Clinic areas last month. Monday 24th June, at 10am. 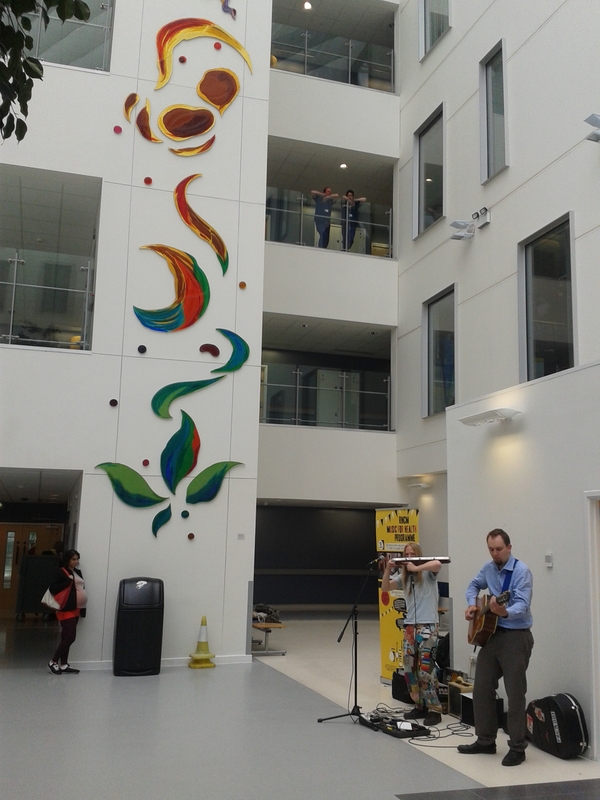 This challenging area was transformed by the wonderful music, as it flowed around the densely filled seating area, lifting the spirits of those waiting and working. The exotic beats drifted through the Manchester waiting room, taking it to far-off places. The music was well received from the outset. The receptionist on duty gleamed with encouraging questions after first spotting the musicians. Individuals who sat alone turned their heads towards the musicians, smiling and tapping their feet to the external stimulus. A man and woman who were sitting together began to gently sway their bodies from one side to the other, to the rhythm of the music. 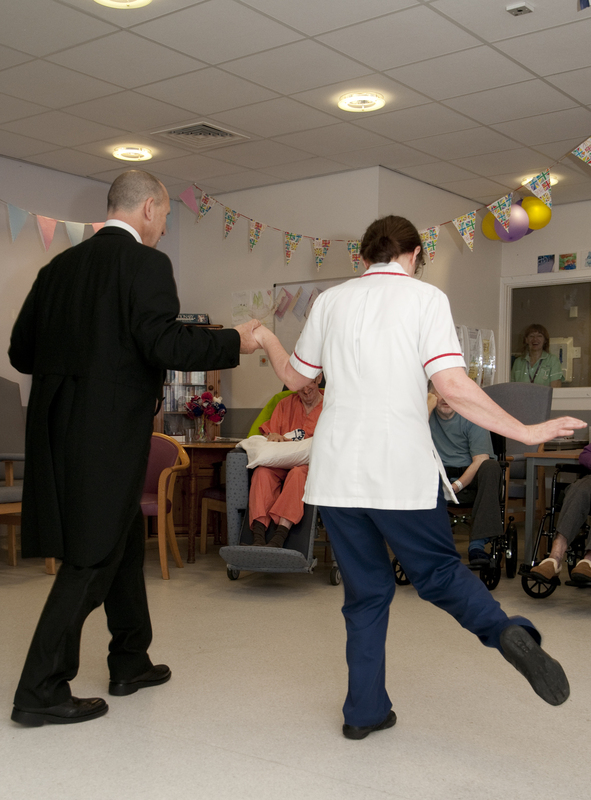 Once the music had begun in the next area, patients started to nod their heads in time to the beat, whilst nurses beamed encouragingly. Again, transforming an even smaller space. Two nurses danced together joyously, laughing as another nurse danced towards them, eagerly requesting for more music to be played. 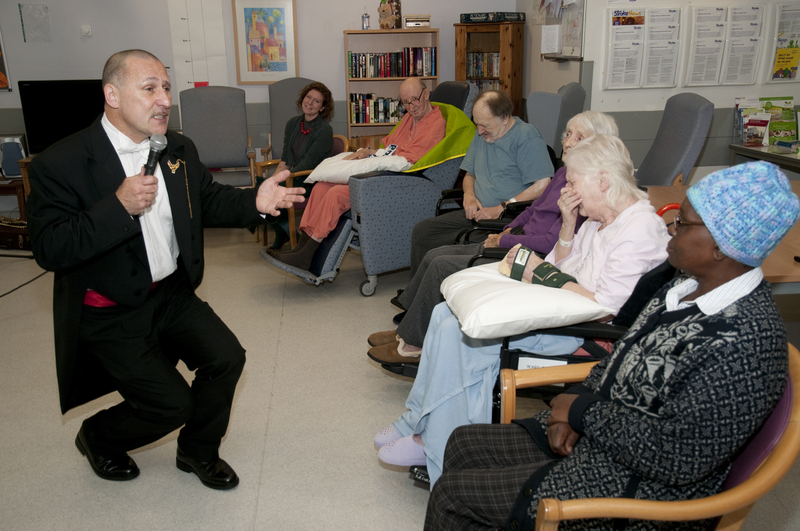 Their demeanour changed to allow enjoyment to take place within the hospital. 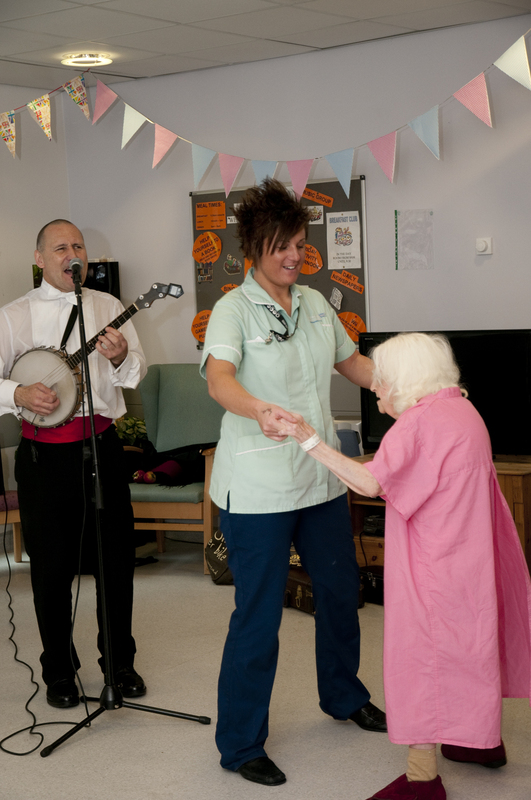 One nurse, who thoroughly enjoyed the music, stated that she would be “happy if it took place again”. After positive feedback from the surrounding individuals and encouragement to continue playing, Ros and Mark proceeded with an additional piece of music. People gathered to watch the musicians play, commenting on the difference made to the environment. A child in a pushchair was engaging well with the music. As a result of this, the interactive element of the music augmented. 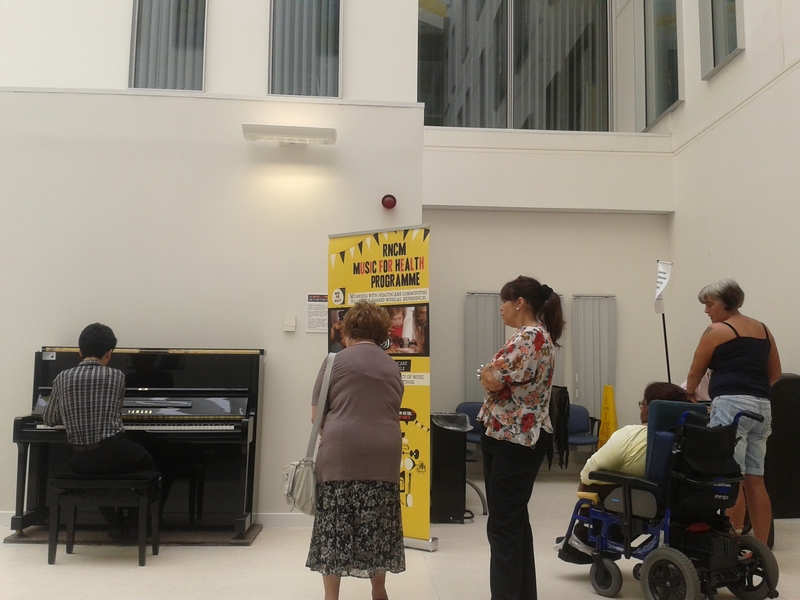 With the use of eye contact, smiling and recognising reactions, an interactive musical experience ensued involving the child, the musicians and the rest of the waiting room. One lady highlighted that, in addition to the music, the way that the musicians smiled and engaged with the individuals around made her feel happy. Here, it is emphasised that connecting with others as a result of music, has an important effect upon patients. An abundant round of applause followed the music, along with cheers and encouragement for more music to be played. 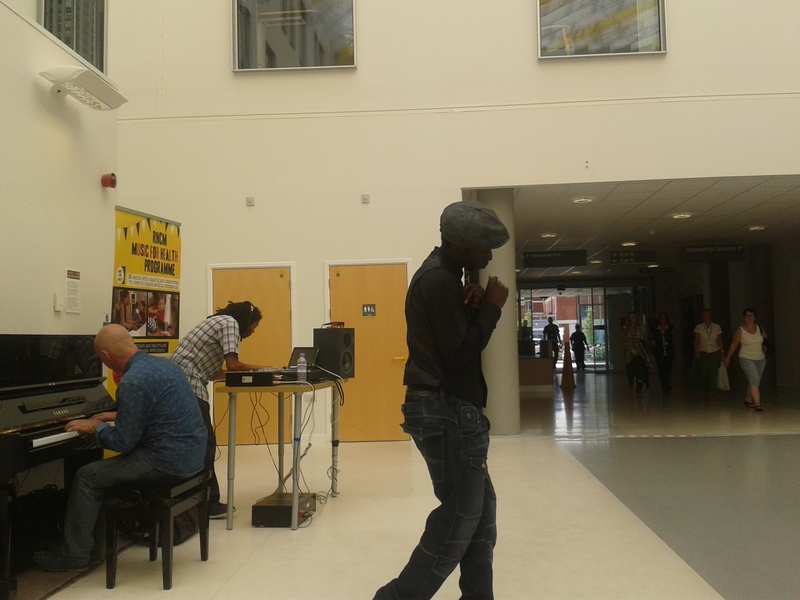 An array of talent was delivered to the Royal Eye Hospital in the form of the DJ Jomo Gaston, Pianist Peter Williams and the Jazz Dancer, Blu. Activating the senses, the positive beats and smooth, expressive, interactive, stylish and soulful dancing filled the space with life. The communication offered by the dancing, created an opportunity for those within the vicinity to be acknowledged and in turn for them to acknowledge another person’s captivating actions. A young toddler with two family members, made their way towards the exit. The toddler extended her arm and made a grabbing motion with her hand towards the trio of artists. This led to them returning from the exit and taking a seat to spectate and absorb the performance. Constantly smiling, clapping, reaching her arms into the air and cheering encouraging sounds, the toddler transmitted an air of joy to her family and the surrounding area. A seamless flow of soulful melodies formed an immersive environment for all to be involved in. The uplifting and inspirational sounds rolled naturally to build a musical soundscape. Without breaking, the music augmented to mesmerise everyone further. Each person kept their gaze fixed upon the musician as they entered the building. Something was thus provided to nurture people’s passionate side, external to the white walls and bleeping machines. The iconic Jools Holland advocates the work of our Manchester Piano Series and accredits the impact that it has. 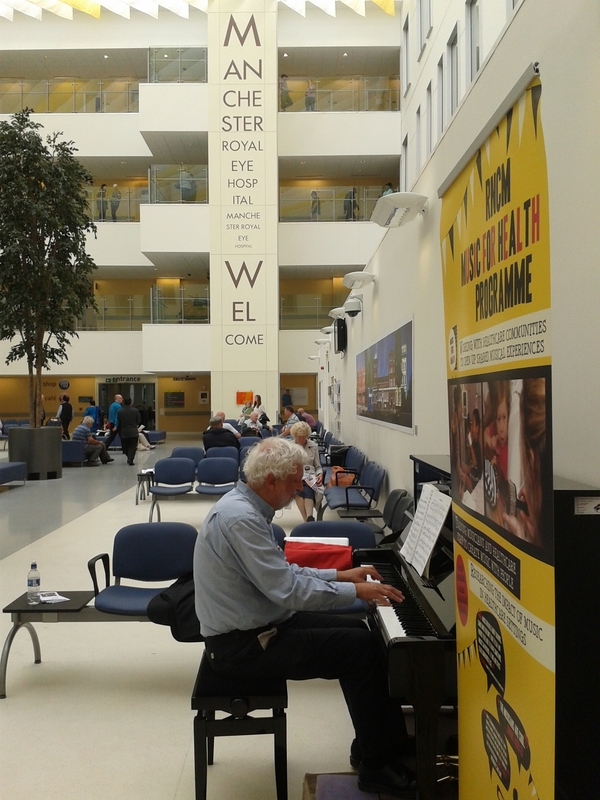 This works alongside the heart-warming feedback we have had from those present at this Summer’s Piano Concert Series to provide a real boost for Music for Health. The atmosphere was turned into something extraordinarily magical by Sura. 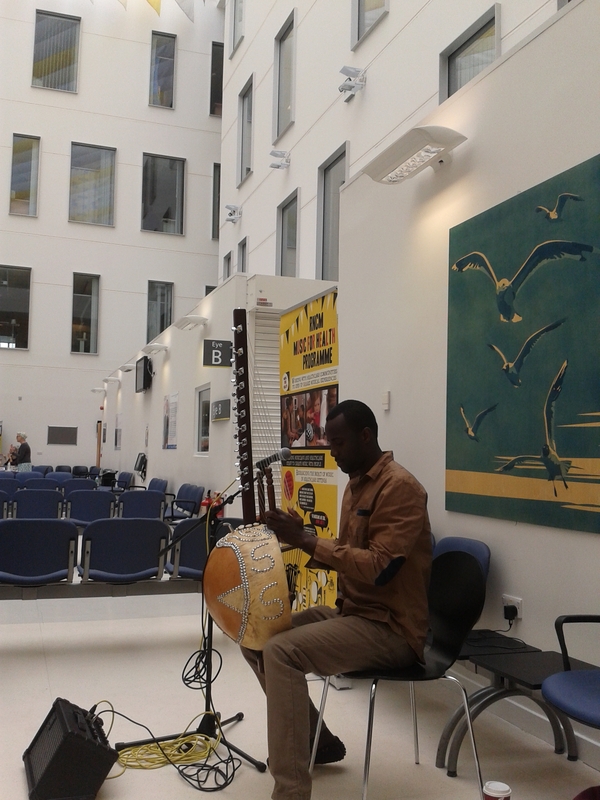 The Kora (a west- African harp) was played so intricately. 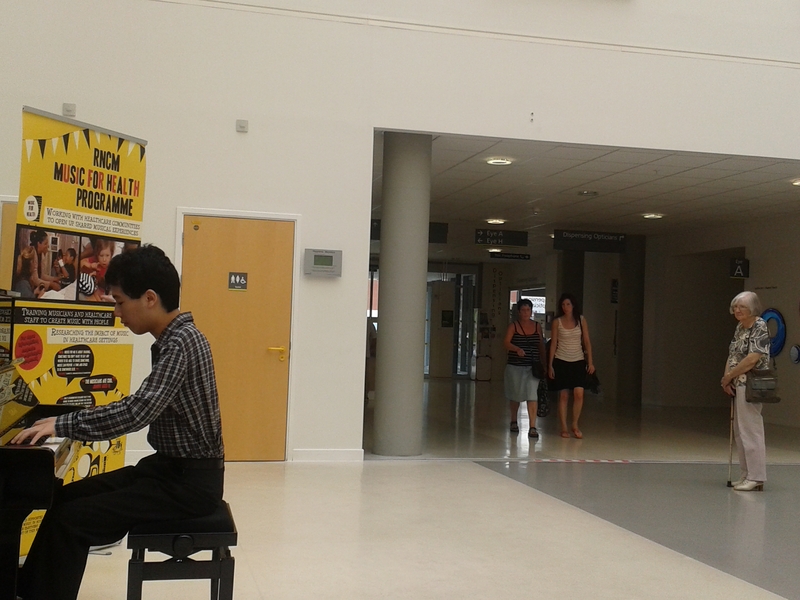 Warmth, joy and good feeling spread, as everybody in the atrium congregated to watch the beautiful melodies. 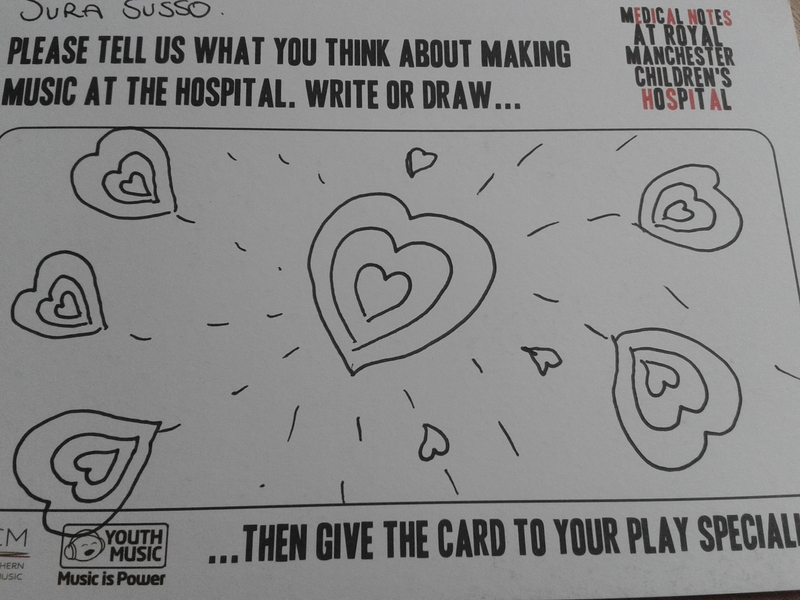 Below, is a lady’s heart-felt drawing, of how she felt about music being made in the hospital. 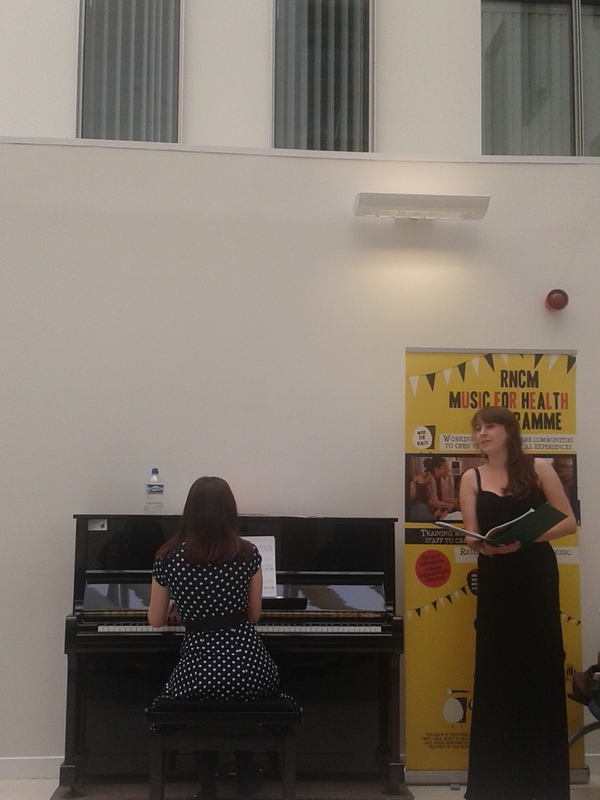 Greta (pianist) and Amy (soprano) gave a wonderfully expressive contribution to the hospital. The soft willowy features of Amy and Greta fused with the graceful sounds, which they produced. This encompassed the entire room in a collective experience, despite the numerous individual experiences also taking place. 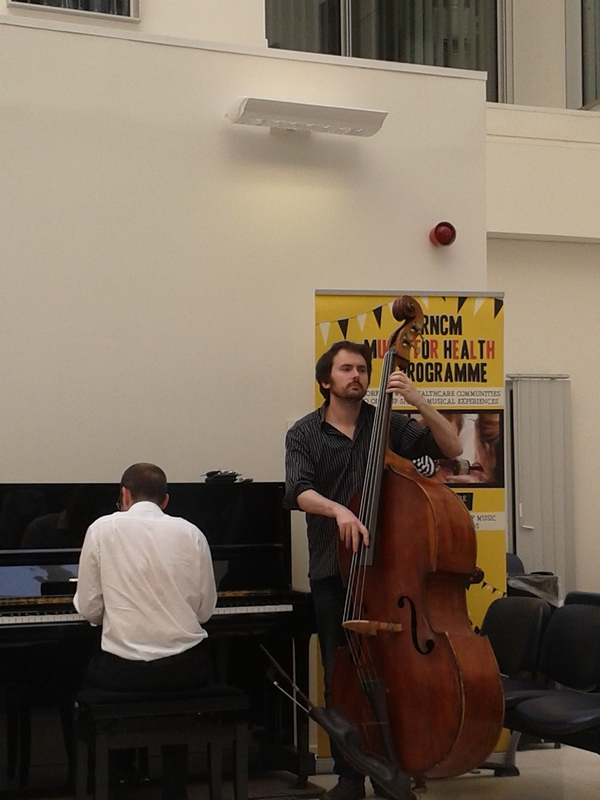 Andrjez Baranek (pianist) and Gavin Barrass (bassist) shared an uplifting jazz-filled performance with the Eye Hospital. Toes were tapping all around. People of all ages were stopping to observe the instruments and listen to the sounds. In awe of what was before them, a trio of toddlers stopped to absorb what was taking place. The jazz beats allowed one to believe they were in a jazz café in the sun! Memories were evoked, along with thoughts of places other than the hospital. The gentleman quoted above, hinted at music’s propensity to have an effect upon people, regardless of the varying nature of human beings. He placed emphasis on how music does not require specific knowledge to have a mutual impact upon individuals. Each song played by Mark McKenzie, was thoroughly uplifting. 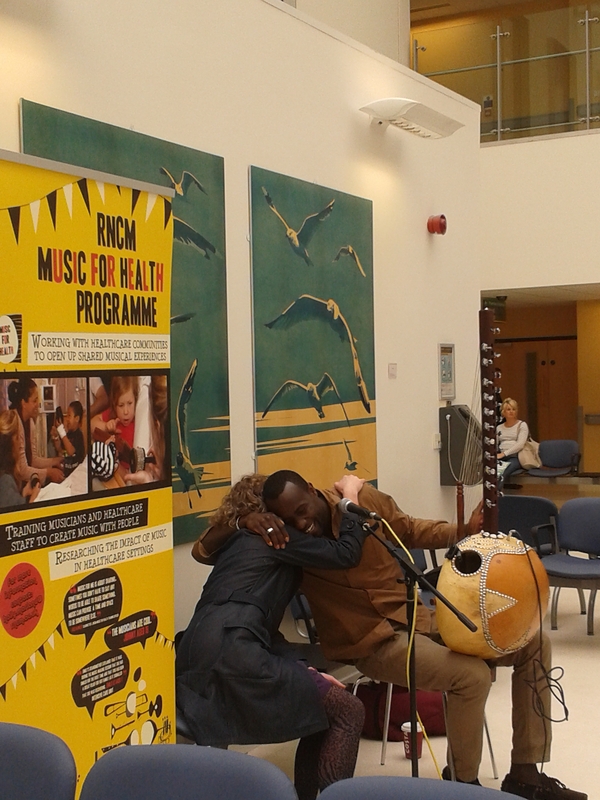 A range of well-known, heartening tunes imbued the room with a comforting musical cuddle! The light and warmth of the day outside worked with the music to have a soothing effect. The heat of the sun and the beautiful music transmitted a feeling of ease. Nurses were humming along to the music as they went about their day, giving them an identity beyond one which their uniforms offered. Martin provided a lovely escape from the pitter-pattering of rain against the windows. On an otherwise gloomy day, he managed to provide a ray of light. “It is like a breath of fresh air, it takes your mind off things, I love music” Outpatient. Liam Curtain’s beautiful selection of sounds brought some light into the room. Robin sunflower, along with the excellent Daniel Blomeley, majestically utilised harmonicas of a range of sizes, as you can hopefully see from the picture below! People gathered around to enjoy the cheerful sounds. 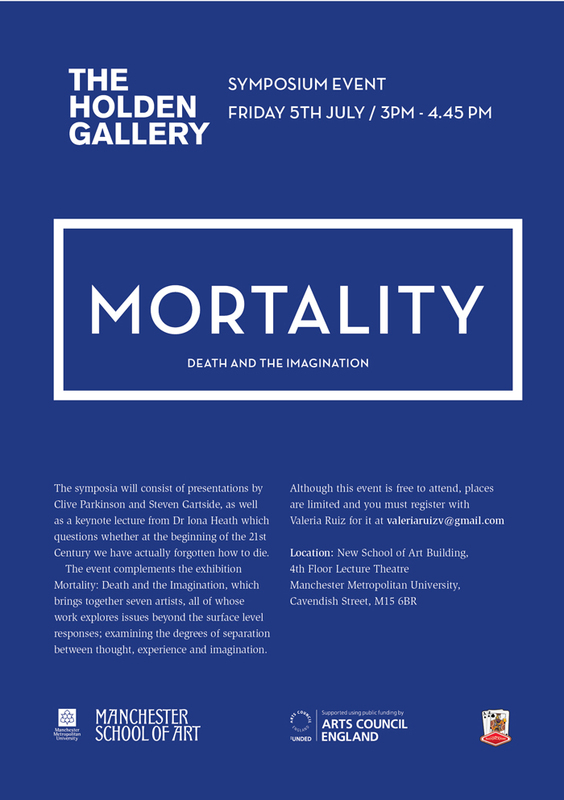 Organised by the marvelous Clive Parkinson, this symposium event will feature music from Victoria Hulme who has written the song cycle Delirium drawing on her work with people who experienced hallucinations in intensive care.